house. WiFi available in house. Free high speed wireless internet access in house, WiFi available in house. LCD HDTVs. We came up here on May 8th because of the graduation at Liberty University. The resort was the closest place we could find. We were pleased when we found a beautiful house like this one for such a good price. We were looking at another place prior but the owner was extremely rude. We loved this house because the owners were very kind and informative. We came from Central PA so our mountains vs. the mountains here are a bit different. The first night we thought we would never make it up but we did and think it's beautiful! We saw a lot of birds, had a chipmunk friend, and half-a-dozen deer. We took walks on the trails and they were gorgeous. We had a wonderful vacation that included breakfast on Mother's Day before we left. We already have friends asking for the house information because they loved the pictures and tales we have shared of our adventures here. Thank you so much! We had a wonderful stay at your house. It was a wonderful experience! The house was quiet, comfortable and had all the amenities necessary to make us feel at home! IÃ¢â‚¬â„¢m not even sure now I can ever stay at a hotel now! We loved seeing the deer hoping across the street and even saw some gophers and a fox! Dinner at the Edge Restaurant @ Wintergreen resort was great --- especially the view! We took the kids mini-golfing and they definitely had a blast! Shannendoah National Park has breath-taking views and same really cool (and pretty tough) trails/hikes --- although our 2.5 and almost 6 year-olds managed just fine. If you want to drive a little (about 1.5 hrs), Virginia Safari Park is a great drive-mru zoo that lets you see the animals! It was amazing! And a few miles from that are the Natural Bridge caverns, which is also a great place to visit --- beautiful! Sherondo Lake (about 15 minutes away) is a great and peaceful place to take the kids fishing and have a picnic by the playground after! All in all, it was a great family vacation! We hope to come back!!! We are a family of four from Carrickfefgus, Northern Ireland. Thanks for allowing us to stay in your beautiful home from 22nd - 26th July, 2013. Everything was fantastic. We enjoyed watching the squirrels and birds from the porch as well as arrival stopping on the drive. We saw black bears and their cubs, deers, raccoons, skunks and a gopher. The Shamokin Fall trail just a few minutes from the house is beautiful! we visited the Luray Caverns whitch was very interesting and definitely worth a visit. We ate at Wild Wolf Brewery just 15 mins from the Resort which had great food and good home brews with live music some nights. Downtown Charlottesville was very pretty and had lots of nice restaurants and things to do. We got very good sandwiches for a picnic in the Mountain Cafe. Hopefully get to visit again. Thanks for a wonderful stay. David, Thank you so much for our great holiday weekend! It was a fun weekend of skiing, ice skating, and tubing. The house was very nice and comfortable. Everything we needed was there. This was our first trip to Wintergreen. We taught our 8 year old and 3 year old how to ski. They were pretty good and learned so fast! It's a perfect place for kids. If we go back in the future, we will rent form you again! Thank you again! I enjoyed this lovely house for a full month from late July to end of August. Cool and clear mountain air without the need of any air conditioning and no mosquitoes. My kids and grandkids visited me on weekends from the DC area and enjoyed hikes, golf, and swimming as well as camping at Sherando Lake and then coming up to the house for a quick respite. The wildlife was enchanting with deer and bear in view. It was a relaxing month of lovely hikes and nice brew pubs within a short drive. Everything that I needed was in the house as well as a lovely deck to sit out and enjoy the cool mountain air. I highly recommend this house as a nice retreat in the lovely Blue Ridge Mountains close to Charlottesville and yet secluded with no traffic or city noise. Wintergreen has something for everyone whether it be golf, hiking, swimming or the spa. I also had several enjoyable meals at the restaurants as well as lovely takeout from the Market. Changhong and David Lindsey were great hosts; thank you both for sharing your lovely home. I would highly recommend this this property to friends and family and plan to return myself. We rented this ski house for the 2011-2012 ski season. The owners were very easy to deal with and incredibly accommodating. They are responsive in all communications. The house is cozy and has everything our family of six needed. 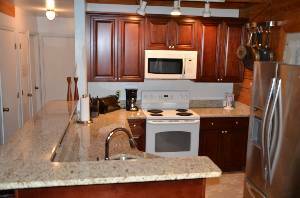 The kitchen is newly renovated with granite counters, new appliances and breakfast bar for four. The kitchen is fully stocked. The first floor bathroom is also newly renovated. Stackable washer and dryer are great. There is wifi internet connection, which worked great. They have two wide screen HDTV and a large, diverse selection of DVDs. The house has a wonderful deck that wraps around 3/4s of the house. There is a lot of space outdoors for children to play and explore. The house is almost right next to the Appalachian Trail and other hiking trails. It is a quick 5 minute drive to the Wintergreen Village. Very Cozy! We stayed at David's house for a couple of days, and really enjoyed it. We felt very comfortable and everything worked perfectly. The internet connection and many DVD movies were great for all of those not skiing. Two families met up at this great home. We skied, snow tubed and ate way too much! The movie selection (DVD and VHS) is great with a variety that anyone can be happy with. The 3 kids enjoyed "their" room that had bunk beds and a full size bed along with their very own TV and VCR with a great movie selection. Very convenient to all that Wintergreen has to offer. They had a washer and dryer so we could dry our wet ski clothes and be warm and toasty for the next outing. The sunrise in the am was great too! The kitchen is well stocked with everything you need and then some. Better selection of kitchens utensils, pots pans and dishes than most rentals we have been in. The wood stove kept us very warm. Thanks for sharing your home with us! 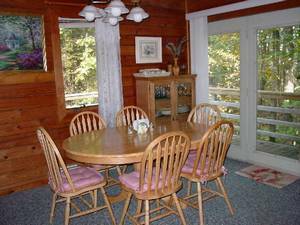 We truly loved and enjoyed our stay in this warm house for a lovely Thanksgiving holiday at Wintergreen. The home was the perfect size for us – parents, daughter, son and his fiancée. We joined other family members staying at another Wintergreen home for Thanksgiving dinner and the house gave us a cozy respite from the larger crowd! We really enjoyed our family card game next to the warm cozy fire. We found everything we needed and felt right at home. If our plans take us to Wintergreen again next year we will definitely come back! We strongly recommend it to others. This is a story about five women who came to this mountain to stay in the comfortable cottage to have a meeting of the minds, mixed with lots of food and cocktails. We brainstormed about how to grow our business. We ate tacos, spaghetti, doughnuts and coffee cake and anything else we could find. We saw a live motor boat, flashed each other and saw what beautiful lips really look like. We played Never have I ever, Truth or Dare, 2 Truths and a Lie and acted like teenagers. We sang karaoke at the tope of our lungs. And we found out that we had more in common than we have different. Here’s to a charming cottage in the woods with good food and great company. Nellysford, Waynesboro,Charlotteville and Stauton and we stopped in Batesville for a home made Ice Cream Cone. The house was very confortable, the resort so huge and clean. We were definitely very impressed. The average temperature for the week was 90 F, a little bit hot, but we took the time to cool down at the Chestnut Pool just nearby, and this on a daily basis. Just Perfect. The 4 Quebec Province cyclists really appreciated the location of your charming house. For us the ultimate advantage was having the Blue Ridge Parkway just behind the house. During our one week stay, we have seen great scenic views. We were definitely very impressed. The house was very comfortable. We were greatly appreciated. The resort is so huge and so clean. The next trip we planed here will surely be in December. Thanks again and we love your place. We will recommend your place to all our friends. sitting by the fire and reading! Tennis, natural beauty, and history ---- Wintergreen is an area unique in the nation that was particularly suited to our family. We saw and did as much as we could in ten days (09/04 - 09/15) and came to the realization that there are at least three ways to get to any one place --- and with the appropriate map --- probably more. >> We hiked, visited historic districts from Lexington to Harpers Ferry, participated in a tennis tournament in Salem (Clay courts!!! ), enjoyed the gourmet grocery on Rt 250 and drove the Blue Ridge Parkway and Skyline Drive. We took photos, enjoyed the rain, searched for bears and stalked groundhogs. >> All in all, a fine time in a beautiful location. Our only regret is: It is 3,000 miles away from home! Tennis, natural beauty, and history ---- Wintergreen is an area unique in the nation that was particularly adapted to our family. We saw and did as much as we could in ten days (9/04 - 9/15) and came to the realization that there are at least three ways to get any one place --- and with the appropriate map --- probably more. We hiked, visited historic districts from Lexington to Harpers Ferry, participated in a tennis tournament in Salem (Clay courts!!! ), enjoyed the gourmet grocery on Rt 250 and drove the Blue Ridge Parkway and Skyline Drive. We took photos, enjoyed the rain, searched for bears and stalked groundhogs. All in all, a fine time in a beautiful location. Our only regret is: It is 3,000 miles away from home! We had lots of fun for the week while we were staying in your house. The weather was excellent. We enjoyed the nearby trails and encounters with the local bears, deers, and weasels. The house was great, comfortable and managed to keep the guests happy. We enjoyed a local day trip to the Natural Bridge via the Blue Ridge Parkway (highly recommended) and the Monocan Lake down in the valley. The Copper Mine has a great steak. Thanks! We had lots of fun for the week while were staying in your house. The weather was excellent. We enjoyed the nearby trails and encounters with the local bears, deers, and weasels. The house was great, comfortable and managed to keep the guests happy. We enjoyed a local day trip to the Natural Bridge via the Blue Ridge Parkway (highly recommended) and the Monocan Lake down in the valley. The Copper Mine has a great steak. Thanks! We found you to be very thoughtful in the hospitality "business" when offering your personal property for rent (we own a cottage in Vermont). 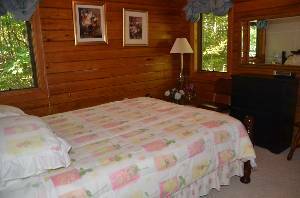 You have all the necessities for your guests and we had a delightful time in your wooded peaceful place in the kingdom. We used all of our senses experiencing Wintergreen. We were there to celebrate our son¡¯s best friend¡¯s wedding and it was beautiful. It was held at a lovely place called Pharsalia --- an old historic plantation about 45 min from the house. Thank you for a great and comfortable time catering to all our needs! Thanks so much for letting us stay in your lovely home! We really enjoyed the weekend of June 10-12 that we spent up in the mountains! All eight of us -- grandparents, parents and four kids -- found the house to be particularly cozy. The sleeping arrangements were very comfortable! We are from New Jersey. We loved exploring the area and hiking the trails. The waterfall was fantastic! That was truly a delightful experience. We hope that we can come back again someday! Thanks again! My friends and I picked a perfect home for our spring break getaway! This house was so cozy and had everything we needed. 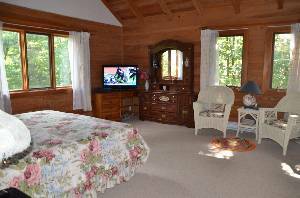 We especially loved the wood stove and the beautiful and spacious master bedroom. The cabin-like feeling inside the house was neat. What a perfect place to come home to after a day at the slopes! Thank you so much! We hope to return soon. We arrived on Wednesday evening to an ice storm and when we left on Sunday, it was close to 70 oF! A little bit of winter wonderland and some great hiking weather --- All in the same weekend. We had a great time. It was a wonderful Thanksgiving Holiday in the mountain. Your cabin is just perfect!! We arrived on Wendnesday evening to an ice storm and when we left on Sunday it was close to 70 oF! A little bit of winter wondland and some great hiking weather --- all in the same weeekend. We had a great time in the mountain for the Thanksgiving. Your cabin is just perfect! We just returned from an April getaway, full of peace and quiet and great hikes. Plus the tennis courts, spa, and devils knob grill were just down the hill. The house had many brochures for local attractions and trail maps, along with good dvd selection and well equipped kitchen. The owner made the rental process easy with clear directions and contact numbers. What an enjoyable rental!! 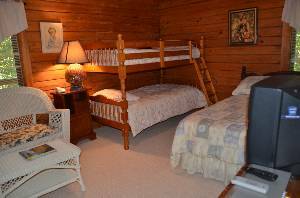 We had a really nice time in your cabin + in Witergreen, skiing, snowboarding, pool, sleeping. Our party of 7, from NC and Lake Charles, LA, slept easily and comfortably. We loved the house, very cozy! Our 3 boys loved your movie selection. They liked the Lord of the Rings. Everyone had a lot of fun. We will definitely use your place in the future and highly recommended. December 31st to January 6th 2005 -2006!! We, 8 seniors of VCU, had so much fun this week, even if we couldn¡¯t remember the date. We lost track of time and date. Even though we thought we had an extra day it was fun. The house was beautiful, which was our perfect house for a week. I can¡¯t think of a better way to spend New Year¡¯s Eve! I have had the best week ever! Thank you so much for sharing your house with us. There were so many memories from our stay that we¡¯ll take with us! Thanks for all the happiness! Visited in January 2006. We loved the house, very cozy and a great location. The Lindsey's were great to work with and made renting their home easy. The home was well stocked and has everything you need. We hope to return next year. December 31st to January 6th 2005 -2006!! We, 8 seniors of VCU, had so much fun this week, even if we couldn’t remember the date. We lost track of time and date. Even though we thought we had an extra day it was fun. The house was beautiful, which was our perfect house for a week. I can’t think of a better way to spend New Year’s Eve! I have had the best week ever! Thank you so much for sharing your house with us. There were so many memories from our stay that we’ll take with us! Thanks for all the happiness! It was the first time that our family spent Thanksgiving at a vacation home. We had so much fun that we planed on making it a tradition. The house provided us almost everything that we needed. Thanks for renting us your lovely cabin in making lots of holiday memories. Our family stayed at this wonderful house for a long weekend in October. We can highly recommend it to families because you have a big space, everything is cozy and clean and all you need to feel "at home" is there! We enjoyed long hikes starting at the trail that is just minutes away from the cabin. David provides his guests with details about nearby attractions and hiking maps! We had a great time and will take the kids back next year! We had a great time. The home is on top of the mountain next to the Appalachian Trail - more on the out skirts of the resort which is just what we were looking for. We hiked, played tennis on the mountain and exercised and swam at the spa. Another day we spent in the valley swimming and playing tennis. We also ate in 2 of the resort's restaurants for dinner. Both were excellent. Well, what can I say, it seems its all been said. In May 2005, some American friends and I spent 2 weeks in this perfect house, set apart from nearby dwellings, yet part of Wintergreen as a whole, with all of it's facilities. At anybody's standard, this house is rated top of the range. It has everything you might want. For a garden lover (with so many public parks and estates nearby) or a wine lover (with dozens of wineries in the area), or a hiker (5 minutes from the Appalachian Trail), or a skier, the location is wonderful. There is a huge selection of DVDs and videos, plus cable TV, dishwasher, microwave, etc. The fireplace is very special. The Lindseys are super people to deal with and we look forward to having them in South Africa soon. We had a wonderful time eventhogh it rained. David, thank you for making this a wonderful and comfortable weekend. Mark was very surprised for his Birthday! We enjoyed our stay very much. We'll be back! Thanks again. Our family and our friend's family spent a long weekend in Wintergreen this Winter. We all had a wonderful time skiing, roasting marshmellows, watching movies, and enjoying your comfortable and cozy house in the woods. We will be back! Thank you! Our family and our friend's family spended a long weekend in Wintergreen this Winter. We all had a wonderful time skiing, roasting marshmellows, watching movies, and enjoying your cozy house in the woods. We will be back! Thank you! Enjoyed our stay. Graet cabin just made ourselves at home. Hope to be back. Thank you very much for the wonderful stay. The house was very confortable. Every night we would enjoy a movie from your collections. Highly recommended. Thanks again. A great place to celebrate a first year birthday and a family get-together! Our daughter's first birthday was memorable. Thanks so much for allowing us to rent the nice place. The house was well stocked and comfortable for 11 of us (8 adults and 3 children). We hope to use it again sometime in the future. Thank you so much for the use of your wonderful house. We were there last weekend with my parents and my sister and her family to celebrate my parent's 40th wedding anniversary. The house was very cozy and comfortable. We especially loved the fact that we could walk to several hiking trails!! My niece (4) and my nephew (6) thought the purple unicorn was great. Thanks again!! Memorial Day Weekend! Our family really enjoyed the stay. And our 2 and 4 year old loved the Sat Night at Wintergarden, which was so close by! Thanks for a relaxing weekend in VA --- It is great to stay at a place where you can just make yourself at home! We so enjoyed our weekend stay in your wonderful mountain cabin! Just imagine --- six women enjoying a girls' weekend. It was just like the ya-ya's! Gossip, good food + beverages, movies, and laughs. Thanks for sharing it! We'll definitely come again! We had a great time. Nice and roomy and private. The wood stove was fantastic. Very relaxing. We're back again! The house was warm and cozy. We love it here and the Lindseys are so accomadeting. We really appreciate everything. We shall return again ASAP. Love it! This mountain home was cozy and comfortable meeting almost all of our needs. It was well furnished and clean. Blankets, linens and towels were plentiful and space fit four adults and four teenagers comfortably. Adults played cards and children watched movies at night. Loft was a little small so boys slept on sofas. Wood stove provided warmth and wood was plentiful. A wonderful winter ski weekend. Check in and check out conducive to getting the most out of your vacation. We look forward to next time. This was our third stay at the house but the first one on our own. We went in the fall to see the fall foliage and were lucky enough to hit very close to peak. We stayed two nights and spent our time walking, sleeping, eating and watching the excellent selection of new release movies available in the house. Our favourite part of the house is the cathedral ceiling in the main room and the master bedroom - the spaciousness complements the view of trees out the windows. We love it there and can't imagine anyone being disappointed with a visit to the house or the resort! 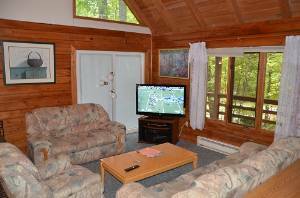 It's the perfect place to spend a few days in a log cabin and commune with nature. My husband and I spent our third visit to the house without friends and family and had a wonderful time viewing the fall foliage on our walk to the village center and back. It's a wonderful resort for any outdoor activity or just to sit back and eat, snooze and watch movies. 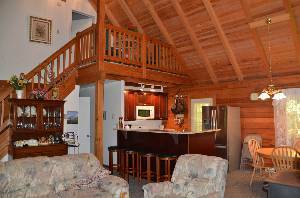 It's the perfect log cabin for a wonderful time in the mountains. The cathedral ceilings complement the views of nature through the many windows. We've been in Summer and Fall and have enjoyed the seasons. The house is located in the perfect place to appreciate the beauty of the mountains without compromising on comfort! This is our third visit to this great Wintergreen get-away, and we have begun to relate to it as a comfortable second home for ourselves. The surrounding woods at this season have given us 20-degree temperature relief from the heat and humidity in the lowlands, and offer solitude and serenity.., especially on days when passing clouds have engulfed us in a cool fog that seems almost magical. We have enjoyed passing deer, squirrels and chipmunks, and relished the absence of traffic or any other ambient or even neighborhood noises. We have taken great advantage of the TreeHouse children's programs, tennis clinics & round robins, pools and yoga classes. It's a safe and happy house that we are grateful to return to for quiet R&R time, and has helped us determine to purchase property here of our own. Our family stayed at this lovely home in Wintergreen for a week during July, 2003. The house provides plenty of space--including kids, there were 9 of us! We especially enjoyed the porch swing and appreciated the selection of DVD's for those rainy afternoons. 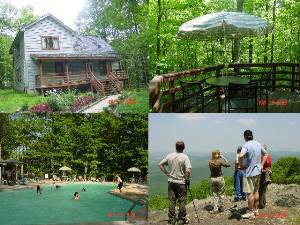 The pool and spa are just a short drive away and Wintergreen itself is a really neat place to visit. The owner's were extremely helpful and made the rental process very simple! I would strongly recommend renting this home to anyone thinking of going to the Wintergreen area. Enjoy! Comment Text: My husband and our kids, ages 3 and 5 spent 8 nights here during the torrential rains of June 2003. The house was so wonderfully removed from the rest of the Wintergreen development, situated at the end of Laurel Springs Drive, mere footsteps from the Old Appalachian Trail, but only 5 or so mintues from the whole mountain center. We enjoyed the front porch swing (especially in the heavy rains), the remote and quiet setting,the spaciousness of the house, the BBQ, the collection of DVDs and videos, and that we were able to sleep close to our kids. We used the upstairs suite more as a playroom for the kids, and my husband used it on a day he had to work from Wintergreen. Lots of great hiking, but too wet for mountain biking. And our kids LOVED the Treehouse childcare program. Also enjoyed the Chestnut Springs pool on the couple days we had sunshine. Wintergreen is the closest we have found to the kind of atmosphere we have enjoyed during the summer at Whistler,BC (we are originally from Vancouver). Wintergreen is not the west coast, but a great substitute when living in DC. The trip home to Bethesda took 3 hours exactly on Sunday afternoon, and it took about 3 1/2 hours to get there on a Saturday afternoon. A great break with lots to do, even in the rain. And we are hoping to return at the end of the summer. Highly recommended. A great value for the money. We could have easily shared the space with another couple or a one child couple. My family stayed in this charming mountain house over Thanksgiving as a HomeExchange guest. It was everything we expected and more. All the comforts of home, in an absolutely breathtaking setting. You're sure to enjoy the natural surroundings. The mountain views are beautiful. We'd love to return for any season. Cancellations and Refunds: 100% Refund if cancel prior to 30 days. 80% Refund inside 30 days. Please ask our new refund policy specially set up for the cancellation due to the warm weather in 2008 ski season.